The Balearic Government has confirmed that it has commenced the first 3 legal proceedings against renters of Caravans and Mobile Homes being advertised on the AirBNB accommodation portal. Historically caravans, mobile homes and tents etc. have been something of a grey area in the legality of renting them to tourists. They have never been legal, nor specifically identified as illegal. However under the new letting regulations applicable to all types of Tourism short term rentals and now in force, legal action can be taken against people renting Caravans and Mobile Homes, and also against the websites where the adverts appear. The Government have confirmed that the first three cases have been opened against caravan renters in Mallorca, and Ibiza actions are considered likely to follow – if those renting the mobile accommodation are not dissuaded by the notification of prosecutions. 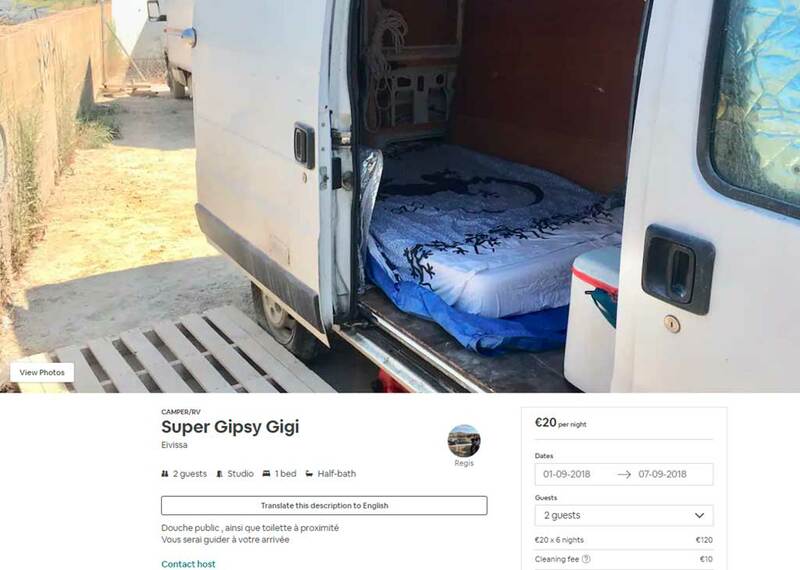 There is a ready supply of Mobile accommodation being offered in Ibiza on AirBNB. In addition to the Caravans, mobile Homes and Yurts, Tents etc, there is even one basic Ford Transit type van with a mattress in the back of it, and a pallet terrace. Who would want to sleep in that? Well it is showing as rented for the whole of August! Comes with a 10€ cleaning fee.